Today’s American students might have trouble understanding why the German people all of a sudden turned against the Jews in 1933 under the leadership of that madman Adolf Hitler. The German Jews were completely innocent, so why were they suddenly persecuted for no reason? Actually, the persecution of the Jews in Germany, and in other countries in Europe, had already been going on way back in the 13th century. 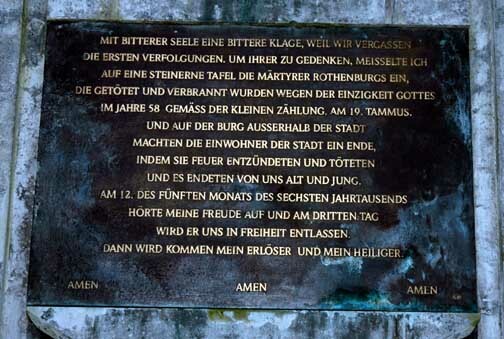 On June 25, 1298, in the German city of Rothenburg ob der Tauber, ordinary citizens of the city committed mass murder, killing and burning their Jewish neighbors. 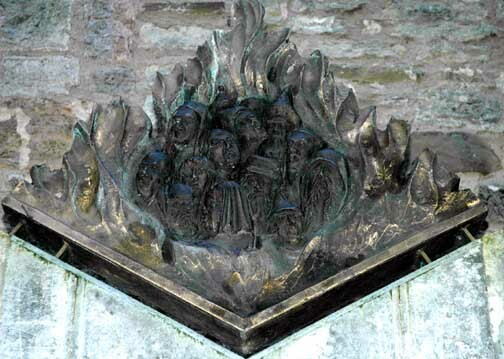 The photo above shows part of the Jewish memorial in Rothenburg ob der Tauber, which has a sculpture that shows the Jews being engulfed by flames. The inscription on the memorial says that the Jews were burned in a fire ignited by the inhabitants of the city. Apparently, the Jews had sought refuge at the Castle, but were attacked there by an angry mob; it is not exactly clear to me whether the Jews were killed and then burned, or burned alive. Jews had been living in Rothenburg since 1180. You can read about the famous Rabbi Meir ben Baruch of Rothenburg ob der Tauber here. So what happened in June 1298 that got the Germans so riled up? The story goes that, in 1298, after more than fifty years of peaceful co-existence between the Jews and the Germans in Rothenburg, there was a series of uprisings in Germany that were led by an “impoverished nobleman” named Rindfliesh, who was from the city of Röttingen. Only two years after the Holocaust of 1298, the Jews returned to Rothenburg ob der Tauber, but there were more uprisings in 1336, 1338, and 1342 in which the Jews were murdered or driven from the city. In 1348, the Jews were murdered or driven out of Rothenburg ob der Tauber again because of accusations that they had started an epidemic of the Bubonic Plague by throwing diseased bodies into the city wells. In 1349, Jews were burned at the stake in an attack that was organized by a congregation in a Catholic church. There were similar attacks on the Jews in Nürnberg and Frankfurt. The Jews who were driven out of Germany went to Poland, an impoverished country, which welcomed them. One might ask why the Jews kept returning to Rothenburg ob der Tauber when it was clear that their lives were in danger there. In those years, the Jews were persecuted everywhere in Europe and they were eventually expelled from every country, starting with England in the year 1290 when King Edward I ordered all the Jews to leave, after an accusation of ritual murder. At that time, Germany was a collection of states, loosely connected with each other in the Holy Roman Empire, but without a strong federal government which could have officially expelled the Jews from every city and state. 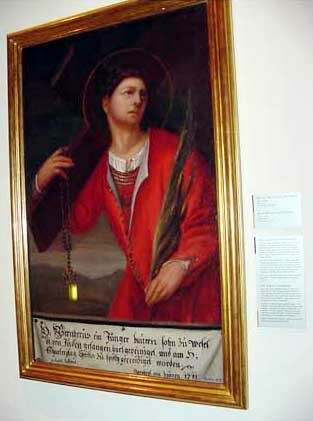 After each uprising in Rothenburg ob der Tauber and other places in Europe, the citizens eventually allowed the Jews to return because they had to rely on Jewish money lenders when they needed to borrow money, since this occupation was forbidden to Christians. The persecution of the Jews in Europe continued and in 1511, the Jews in Rothenburg ob der Tauber were forced to wear a yellow badge on their clothing to identify themselves as Jews. The Jews were finally driven out of the city for good in 1520, at which time Christians were allowed to become money lenders. 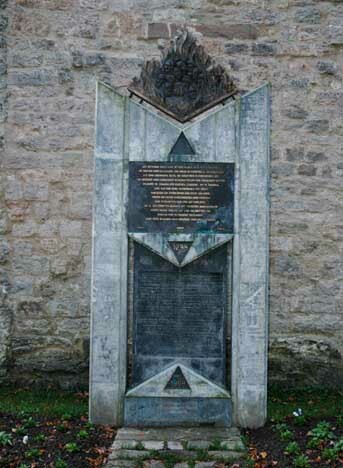 In 1871, the German states were united into one country and the Jews were given the same civil rights as other citizens; in 1875 a new Jewish community was established by 8 families who moved to Rothenburg ob der Tauber. In 1933 when Adolf Hitler came to power, the persecution of the Jews in Germany began again. On October 10, 1938, the last 17 Jews in Rothenburg ob der Tauber were driven out of the city by the local citizens; their fate is unknown.